1. Line a baking sheet with parchment paper, set aside. 2. In a medium saucepan over medium heat, combine caramels and cream. While stirring constantly, heat mixture until caramels are fully melted. Remove pan from heat. 3. Using a rubber spatula, fold in the vanilla and cashews until they are thoroughly mixed into the melted caramels. 4. Spray a small or medium cookie scoop with non-stick cooking spray and scoop the caramel-cashew mixture 2 inches apart onto the prepared pan. If you prefer a more symmetrically shaped cluster, use your fingers to mold this caramel. Repeat with rest of mixture. 5. In a microwave-safe bowl, melt the chocolate and shortening until smooth stirring every 30 seconds or so. 6. 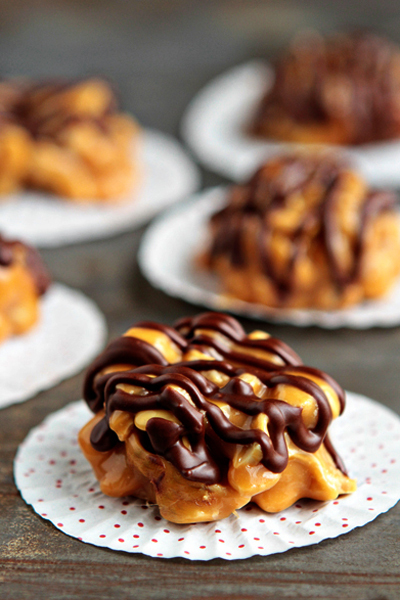 Drizzle melted chocolate over clusters. See recipe notes for storage information. – The clusters are sticky, so you’ll want to store them on parchment in the refrigerator. Leave them on the parchment and remove them to room temperature about 30 minutes before serving. – Definitely feel free to experiment with the type of nuts that you use. Salted pecans or peanuts would be delicious. – Love chocolate? You can definitely cover these completely with chocolate, you’ll just have to play around with the proportions a bit. We prefer them with just a drizzle.